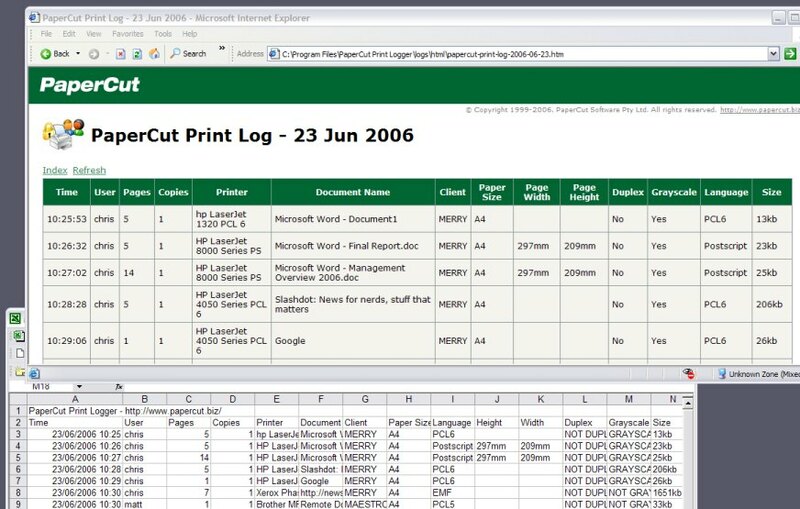 PaperCut Print Logger is a free print logging application for Windows systems designed to provide real-time activity logs detailing all printer use. Information tracked includes the time of print, the name of the user who printed, the total number of pages, document names and titles and other job attributes such as paper size, color mode and more.Real-time logs ensuring printing history data is always current and live. Logs are available in a viewer friendly HTML format, or in CSV or Excel format for advanced users needing the data for further analysis. * Easy to use HTML interface. * Now available in English, French and German. * Real-time logs ensuring printing history data is always current and live. * Data is available Microsoft Excel compatible format allowing for detailed analysis and charting. * Compatible with both desktop and server versions of Microsoft Windows. * Works with almost all major printer makes and models. * Non obtrusive - no need to modify the printing process or configure printers differently. It monitor msn messeenger, click of mouse and so on. Qweas is providing links to PaperCut Print Logger 1 as a courtesy, and makes no representations regarding PaperCut Print Logger or any other applications or any information related thereto. Any questions, complaints or claims regarding this application PaperCut Print Logger 1 must be directed to the appropriate software vendor. You may click the publisher link of PaperCut Print Logger on the top of this page to get more details about the vendor.